Perfect for cleaning up small spills and wiping down oily tools and equipment, this high capacity maintenance sorbent pad is highly absorbent so it's perfect for placing directly on machinery. Convenient size lets you quickly spread sorbent on and in the path of a spill of coolants, water soluble oils and more. Use on most nonaggressive liquids and to absorb up to 37.5 gallons. Pads will not damage plant equipment. Low profile design allows it to fit in tight places. Tuck it in or around machines to catch and contain leaks at the source. 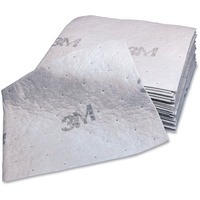 Maintenance Sorbent Pad features a scrim on one side to increase strength and help reduce linting.